Hello its Gavin here again. I’m looking at a camp called Rockets. 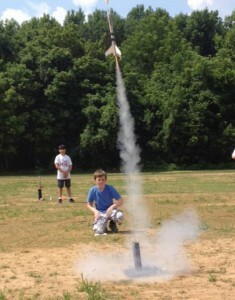 Today the campers made Stomp Rockets. Stomp Rockets are made of recyclable water bottles and straws. Your kids will love this part of the camp but what they will love even more than a Stomp Rocket is a real Rocket that they build and blast off. In the past we built Rockets that had a little place for an raw egg. When the kids launched their Rockets, we made a test to see if the egg shell cracked or not. Now we launch the Rockets at a selected arena with no trees so that your kids don’t lose any Rockets in the trees. We at The Original Curiosity Camp(TOCC) are all about safety of your children so we make sure that your children are far away from the launch sites of these Rockets. We share information with the campers and their parents about how to launch their rockets safely.